Corrugated box design is the process of matching design factors for corrugated fiberboard boxes with the functional physical, processing and end-use requirements. Packaging engineers work to meet the performance requirements of a box while controlling total costs throughout the system. In addition to the structural design discussed in this article, printed bar codes, labels, and graphic design are also vital. Ordinary shipping containers require printing and labels to identify the contents, provide legal and regulatory information, and bar codes for routing. 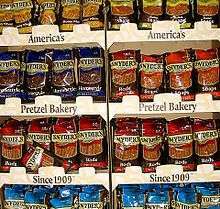 Boxes that are used for marketing, merchandising, and point-of-sale often have high graphics to help communicate the contents. Some boxes are designed for display of contents on the shelf. Others are designed to help dispense the contents. Popular for their strength, durability, lightness, recyclability, and cost-effectiveness, corrugated boxes are used for the shipping of a variety of items. Due to the quality and safety of packaging items in corrugated boxes, they are used widely in the food industry. The boxes handle the pressure that comes with stacking, making them ideal for easy transporting. More than 95% of all products in the United States are shipped in corrugated boxes. Corrugated paperboard accounts for more than half of all the paper recycled in the US. One of the important functions of a corrugated box is to provide crush resistance (product protection) and adequate strength for stacking in warehouses. A box can be designed by optimizing the grade of corrugated board, box design, flute direction, and inner supports. Support from the product also provides "load sharing" and can be an important factor. Box closures sometimes can have effects on box stacking strength. If long-term storage of corrugated boxes in high humidity is expected, extra strength and moisture resistance is called for. The method of loading boxes on pallets strongly affects stacking. Vertical columns provide the best box performance while interlocking patterns of boxes significantly reduce performance. The interaction of the boxes and pallets is also important. Box compression testing is a means of evaluating boxes, stacks of boxes, and unit loads under controlled conditions. Field conditions of stacking and dynamic compression do not have the same degree of control. Compression strength can be estimated based on container construction, size, and use parameters: actual package testing is often conducted to verify these estimates. Many packaging engineers find it beneficial to periodically audit warehouses and visit customer's package receiving operations. When field performance is observed or documented to have problems, a new cycle of design and testing may be justified. for a corrugated box to withstand the deformation while stacking or storage (stack load = 1/3 compression strength). where stack load=gross weight of box *stack height. Engineers and designers start with the needs of the particular project: cost constraints, machinery capabilities, product characteristics, logistics needs, applicable regulations, consumer needs, etc. Often designs are made with Computer Aided Design programs connected to automated sample making tables. Several design and construction options might be considered. Samples are often submitted to performance testing based on ASTM or other standard test protocols such as the International Safe Transit Association. Structural design is matched with graphic design. For consumer based designs, marketing personnel sometimes use Focus groups or more quantitative means of assessing acceptance. Test markets are employed for major programs. The process starts by making corrugated board on a corrugating line, a long series of linked machines which may be in size of a football field. A finished piece of singlewall corrugated board is a single corrugated layer sandwiched between two liners. Skilled workers prepare job tickets for each stack of box blanks and route the blanks to fabrication machines. Printing dies and patterns are prepared on large, flexible, rubber or tin sheets. They are loaded onto rollers and the box blanks are fed through it, where each is trimmed, printed, cut, scored, folded, and glued to form a box. Finished boxes are then stacked and sent to a banding machine to be wrapped and shipped. The most common box style is the Regular Slotted Container (RSC). All flaps are the same length from score to edge. Typically the major flaps meet in the middle and the minor flaps do not. The manufacturer's joint is most often joined with adhesive but may also be taped or stitched. The box is shipped flat (knocked down) to the packager who sets up the box, fills it, and closes it for shipment. Box closure may be by tape, adhesive, staples, strapping, etc. FOL (Full Overlap): A Full Overlap Box is similar to an RSC except the major flaps fully overlap. Full-overlap flaps provide extra stacking strength and edge protection. HSC (Half Slotted Container): Half-Slotted Containers (HSC) are similar to an RSC, but with only one set of flaps. They are useful when an open-top container is desired. HSCs can be used to create a telescope box. A Full Telescope Box has two fully telescoping sections. The sections may be formed by staples, die-cut locks, adhesive, etc. A Partial Telescope Box has two sections. The top telescopes partially over the bottom. Commonly used for holding printing paper. Special die-cut shapes have almost endless designs and uses. The size of a box can be measured for either internal (for product fit) or external (for handling machinery or palletizing) dimensions. 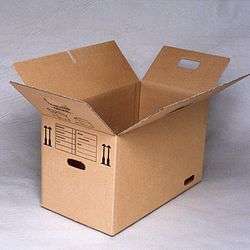 Boxes are usually specified and ordered by the internal dimensions. Box styles in Europe are typically defined by a 4-digit code specified by the European Federation of Corrugated Board Manufacturers (FEFCO): for example a regular slotted container (RSC) is coded 0201. FEFCO styles are normally the basis for more complicated special designs that incorporate, for example, locking tabs or internal fittings. Wholesale outlet using corrugated boxes to stock shelves. Box (lug) used for fruit. Box needs to be open to allow respiration and access to cold chain. Tabs interlock when stacked on pallet. Box construction needs to be matched to its logistics system. Packages designed for controlled shipments of uniform pallet loads may not be suited to mixed shipments with express carriers. Many items are shipped individually (in part or entirely) by express carrier, mail, or other mixed logistics systems. The demands of multiple manual handlings, automated sortation, and uncontrolled stacking in trucks or air containers put severe stress on boxes, box closures, and the contents. Boxes designed for unit load handling and storage may not be suited to mixed logistics systems. Less than truckload shipping puts more stress on corrugated shipping containers than shipment by uniform pallet loads in trucks or intermodal containers. Boxes sometimes need to be heavier construction to match the needs of the distribution system. 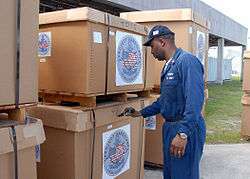 Many items being supplied to governments are handled very well: boxes are unitized, shipped on covered trucks or intermodal containers, and storage is in warehouses. Normal “domestic boxes” and commercial packaging are acceptable. Military materiel, field supplies, and humanitarian aid often encounter severe handling and uncontrolled storage. Special box specifications for government shipments are often applicable. Weather-resistant fiberboards, box construction, box closure, and unitizing are needed. RSCs of MREs being off-loaded from a helicopter. Water-resistant boxes closed with strapping. Many international shipments are handled very well: boxes are unitized, shipped on covered trucks or intermodal containers, and storage is in warehouses. 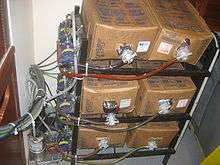 Normal “domestic boxes” are commonly used. Break bulk cargo needs to be water resistant and heavy duty. Even shipments initially sent via intermodal freight transport may have subsequent logistics operations that are extreme and uncontrolled. The specific conditions in the destination port and the country of use need to be considered for design of export boxes. Shipment of dangerous goods or hazardous materials are highly regulated. Based on the UN Recommendations on the Transport of Dangerous Goods model regulations, each country has coordinated design and performance requirements for shipment. For example, in the US, the Department of Transportation has jurisdiction and published requirements in Title 49 of the Code of Federal Regulations. 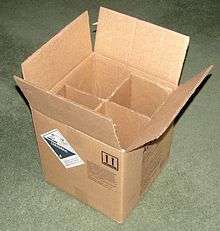 Corrugated boxes are described in 4G requirements. Performance (severe drop test, etc.) needs to be certified for the box and contents. Some carriers have additional requirements. The means of closing a box is an important aspect of design. It affects the types of equipment available to production lines, the measured laboratory performance, the field performance, and the ability of end-users to easily and safely open the box. Adhesive, water based or Hot melt adhesive-Adhesives are applied manually or by machine.starch based adhesives is the choice of a corrugator as it is economic .starch work as a medium for moulds, litchens &fungus so to prevent it antifungals are added in it before use. Staples- staples are used to close the box for effective closing staples should be applied in 45 deg angle. pins are made up of steel,nickel, brass etc. Box sealing tape, pressure-sensitive-taps are available in various widths i.e. 36, 48, and 72 mm widths and several thicknesses. BOPP and PET are used as a backings. Taping is done either mannually or by semi automatic machine. Water activated gummed paper- it consist of a heavy paper in which adhesive is applied and dried,when water is applied to it adhesive tackeness and binding ability is again generated. Strapping- straps are generally used for unitizing,made up of plastic(PP,PE,PET,PVC),metal(SS steel) etc. and available various width. Shrink wrap- it is a thin film of LLDPE, LDPE etc. which shrinks with the application of heat resulting in wrapping a box from all sides.it is costlier amongst all as it needs hot tunnel and material consumption will be more. 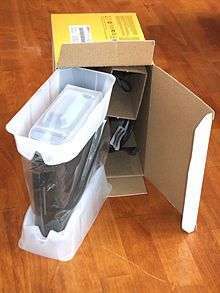 However, the packed box will be protected from environment as it will work as a barrier. ↑ Singh, S. P.; Burgess (November 2001). "Package Specifications for Corrugated Boxes with Heavy Flowable Products in Single Parcel Shipments". J. Testing and Evaluation. 29 (6). ↑ Han, Jongkoo; Park (January 2007). "Finite element analysis of vent/hand hole designs for corrugated fibreboard boxes". Packaging Technology and Science. 20 (1): 1–76. doi:10.1002/pts.741. ↑ Lee, Myung Hoon; Park (September 2004). "Flexural stiffness of selected corrugated structures". Packaging Technology and Science. 17 (5): 235–294. doi:10.1002/pts.663. 1 2 3 4 "Corrugated Box Manufacturing Process | How Are Corrugated Boxes Made". Appleltd.com. 2010-12-20. Retrieved 2014-06-09. ↑ Koning, J; Moody (November 1966). "Slip Pad, Vertical Alignment Increase Stacking Strength 65%". Boxboard Containers. ↑ Sheehan, R (August 1988). "Box and Closure: Partners in Performance". J. Packaging Technology. Technical Publications Inc. 2 (4). D642 Test Method for Determining Compressive Resistance of Shipping Containers, Components, and Unit Loads. This article is issued from Wikipedia - version of the 11/14/2016. The text is available under the Creative Commons Attribution/Share Alike but additional terms may apply for the media files.